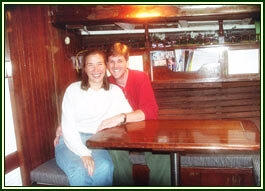 The sailboat is under a 2 year renovation and we are not taking reservations for it until it is completed. Many years out of salt water have taken their toll and now it is time to bring her back to life. 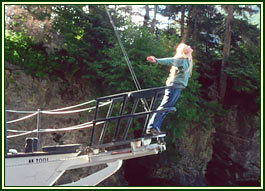 The story of the sailboat is an interesting one though so read on to learn about a real Alaskan adventure in re-purposing. 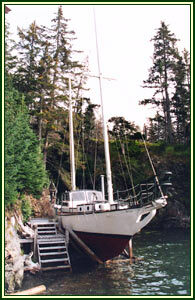 In 1999, the Iversons noticed a beautiful, classic old sailboat in the Homer dry dock. It was on "Death Row", soon to be dismantled to salvage the wood and hardware and the remains burned. After some consideration, and using some of the creative thinking techniques that helped to build Sadie Cove Wilderness Lodge, the Iversons bought the boat with the intention of creating a fifth guest cabin for the lodge. 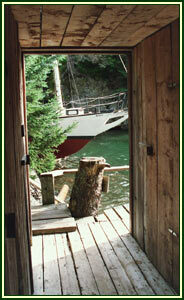 The interior was all mahogany, teak and brass and the boat was well worth the effort it would take to float her across the bay and then winch her up the beach where she sits today, high and dry and ready for overnight guests. It was an effort that took an entire winter to accomplish along with the help of several close friends. Now, at the big tides in the Spring and Fall, the ocean waters rise just high enough to touch the base of her hull reminding her of the days when she was sailing around the world with a full crew. 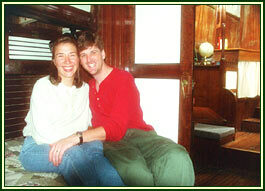 The Sailboat cabin comes equipped with a working cast-iron fireplace, a head (marine language for a bathroom), an outside deck, a lot of privacy and even more romance.